We usually have wine with dinner, and when I’m planning out the pairings, the food usually comes first. But as I was putting together a grocery order last week and browsing the bottles available through Best Cellars, I was surprised to see a white wine listed among their “Big” selections. The bottle in question was a 2004 Oriel “Dylan” Russian River Valley Chardonnay, and while I’m not usually a fan of big Chardonnays, and the bottle was a bit more spendy than we usually go for weeknight dinners, the description of the wine had me intrigued. I added it to our cart and began thinking about building a meal around it. I like pairing scallops with Chardonnay, so I decided on that as my protein – simply seared, with a little vermouth-enriched brown butter. The side was a bit more challenging; since scallops are so mild, I tend to match them with something more aggressively flavored or seasoned, but I didn’t want to make anything overpowering. As luck or serendipity would have it, I happened upon a few recipes for celery root remoulade over the weekend, and decided to go with a variation on that theme. 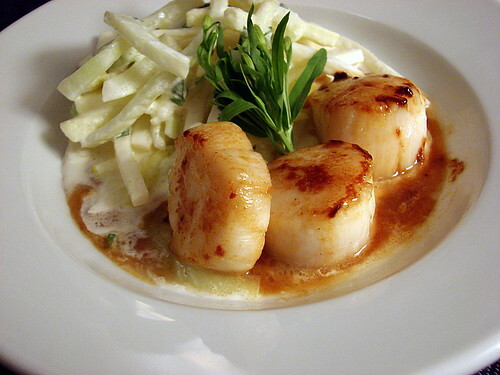 I added fennel and apple to the mix, and ended up with a wonderful combination of crunchy, creamy, tart, sweet and tangy – a great foil for both the scallops and our delicious bottle of wine. Place kosher salt in a bowl, add lemon juice and whisk until salt is dissolved. Add mustard, mayo, crème fraiche and tarragon, and whisk again until well combined. Core the apple, slice into matchsticks and add to dressing. Core the fennel bulb and slice as thinly as possible. Peel celery root and slice into matchsticks. Blanch the fennel and celery root briefly in unsalted water. 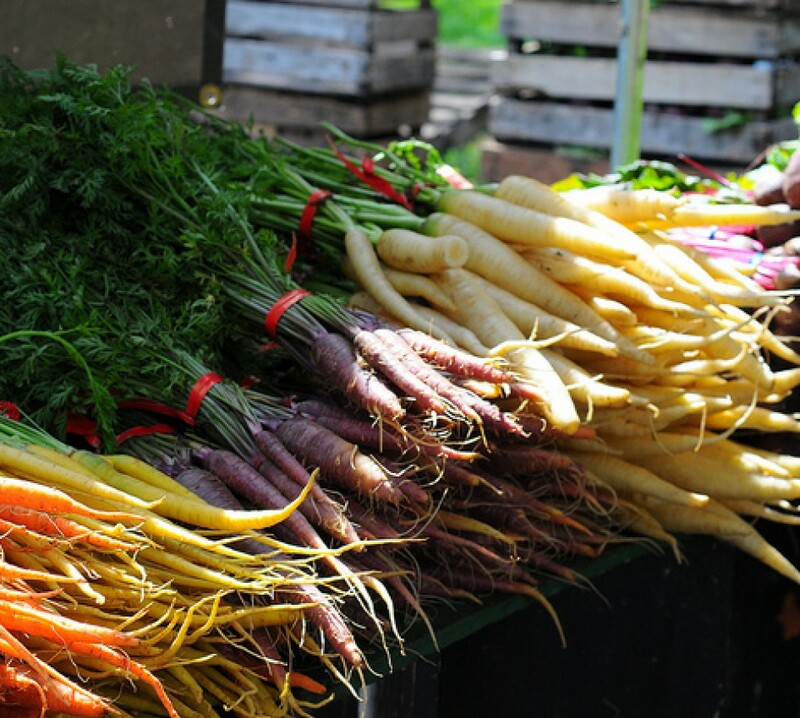 Remove the vegetables using a spider or slotted spoon and shock them in an ice bath. Drain them well, pat dry, and add to the dressing. Toss until the mixture is well-combined, cover, and chill before serving. wow. that sounds/looks fantastic. seasonal, fresh, light. thanks for the inspiration. Since this meal makes you look like a wine pairing guru, do you have any tips to share on how you determine what goes well with what? I love all kinds of wine, but I’m completely clueless as to how people pair them with dishes. Amy and janine – Thanks! Hillary – Ha! I’m certainly no Derrick or Lenn, but I’ll give you a couple of thoughts. I think for me, learning what to pair with certain dishes was a combination of good advice from the people at the wine shops we frequent (and building a relationship with the people who work at them so they get to know your preferences), some research, and plain old trial and error. Food often changes the way a wine tastes or feels in your mouth, so learning what effect certain wines have when drunk with certain foods, and making note of it, has been helpful, too. And everybody’s palate is different, so to a certain extent I think you just have to go with what you like. If you have an opportunity to order a tasting menu at a restaurant and get wine pairings with it, or if you order different wines by the glass to go with different courses of a meal, you can learn a lot. If I have something that works particularly well, I’ll try to at least note the type of wine or grape so I can try pairing it at home. Scallops and chardonnay huh? That sounds quite delicious! I may just have to try that one of these days, thanks for the tip! “Grocery order”? Does this mean your local Best Cellars delivers? I’m so jealous. Here I thought having a Best Cellars a couple blocks from my apartment was divine. Hey Karon! We are very lucky in that Best Cellars has an arrangement with FreshDirect, so we can order wines from them and have them delivered right along with our groceries. We’ve actually got an order coming tomorrow, with a couple of different Oriel reds, among other things. 🙂 I love going to our favorite wine shops, getting recommendations and browsing around, but this is a really convenient way to stock up on things we like and try new things as well, without having to schlep things home on the bus or train.